AUSTIN –The Texas Senate voted 23-8 in favor of Senate Bill 277, the Mission Preparedness Protection Act, to ensure that Texas maintains the military value of our bases and protects flight missions jeopardized by encroaching turbines from the wind farm industry. SB 277, co-authored with bipartisan support, reduces the threat of encroachment by prohibiting subsidies for wind farms within 25 nautical miles of the boundaries of fixed-wing military aviation facilities. “It is bad policy to subsidize something when it is in an area that could have a negative impact on our state’s economy. Texas military installations provide a $136 billion boost to the economy and are responsible for employing over 900,000 Texans directly and indirectly,” Senator Campbell stated. Wind farms are the current leading threat to mission readiness at two Texas military installations, Sheppard Air Force Base and Naval Air Station Kingsville. At an interim hearing last spring, the Veteran Affairs and Border Security Committee heard testimony regarding the danger encroaching wind farms pose to pilots taking off and landing due to their size and proximity to runways, as well as how moving turbines interfere with a pilot’s radar. 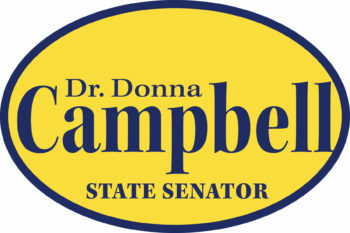 State Senator Donna Campbell represents Senate District 25 and chairs the Veteran Affairs and Border Security Committee.